Today: Move over, carrots; there's a new cake in town. WHO: Hardlikearmour is a veterinarian, baker, cake decorator, and Food52 all star. She lives in Portland. WHAT: A lighter, fluffier carrot cake -- using parsnips instead! 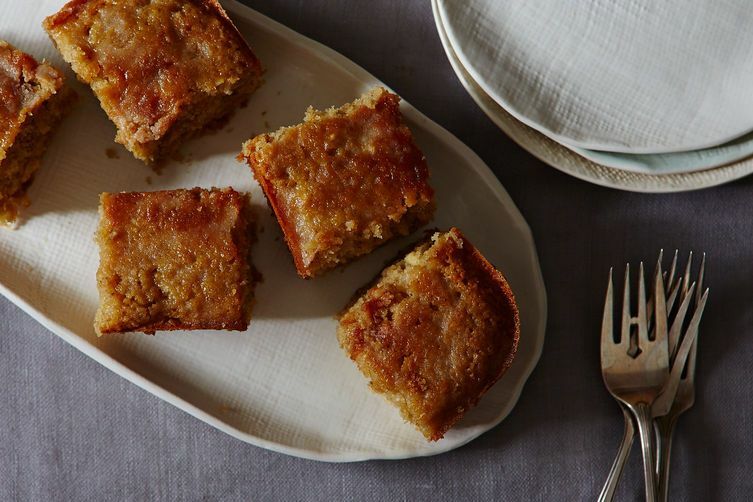 HOW: Shred your parsnips, fold your wet ingredients into your dry ingredients, and bake. Top with a maple-buttermilk glaze. WHY WE LOVE IT: This is one of those recipes we saw and said to ourselves: Why didn't we think of this earlier? And in this cake, parsnips don't just stand in for carrots; the whole cake is lighter, airier, and more delicate than any carrot cake we've had. The parsnip is the star of the show -- with the almond, spices, maple, and coconut as the snazzy backup dancers. We ate this for breakfast and were grinning the rest of the day. Well since I just polished off carrot cake it's obviously time to make parsnip cake! Recipe Maven: I didn't detect even the slightest hint of coconut flavor. I suspect it's more of a texture thing. You could probably leave it out though and substitute with an equal amount of additional grated parsnips. Made it last night for a dinner party, it was a HUGE hit! I didn't have a 9x13 baking pan at my disposal so I used an 8x8 baking pan plus muffin tins. It was the perfect amount for the 8x8 plus 6 lovely muffins (felt more like a muffin than a cupcake, as the batter is dense, although if you want to call them cupcakes, be my guest!). I filled the muffin cups 3/4 full and they came out with a lovely domed top. I ended up with too much glaze -- could have made only 1/2 or 2/3 of the amount and been fine. This recipe is delish! opinions on whether this tastes like coconut? If so, any ideas for a substitute for the coconut? Not a fan of coconut but I have made other recipes that use it where texture gets added much more than flavor. I have two parsnips in my fridge and almond meal and coconut in the cabinet...done! Loved this recipe, HLA. Definitely making again! Congrats HLA! Parsnips on my shopping list! Looks delicious, but I always balk at using that much precious maple syrup unless it's poured over a pancake or waffle. Best substitution? I made this cake last night, and IMO using the amount of maple syrup called for is well worth it! As HLA suggests, perhaps you can make a cream cheese frosting and therefore use only 1/2 cup maple syrup for the cake. Congrats HLA! Thanks, Bevi. I've not done it but if I were going to substitute for the maple syrup I'd use 2/3 cup brown sugar and increase the buttermilk by 2 T (for the cake portion). I'd also probably use a brown sugar syrup (2 parts sugar to 1 part water) for the icing. Yum!!! Making this today I need a couple of hours in the kitchen to de stress and this is perfect! Very tempting - but what is French four spice? I am thrilled this recipe got a WC! It has a special place in my heart. Thank you all!!! Parsnips in the garden, here I come:) Congrats!! Hey, Sara, congrats on the wild card win!! Saving this! Yipee! Congrats on a well deserved wild card!! GREAT idea, HLA! I love this. Saving right now!! Yes!!!! Such a well deserved wild card! Love this cake! !